I'm Here. I'm Queer. What the Hell do I read? : This Blog In The News! 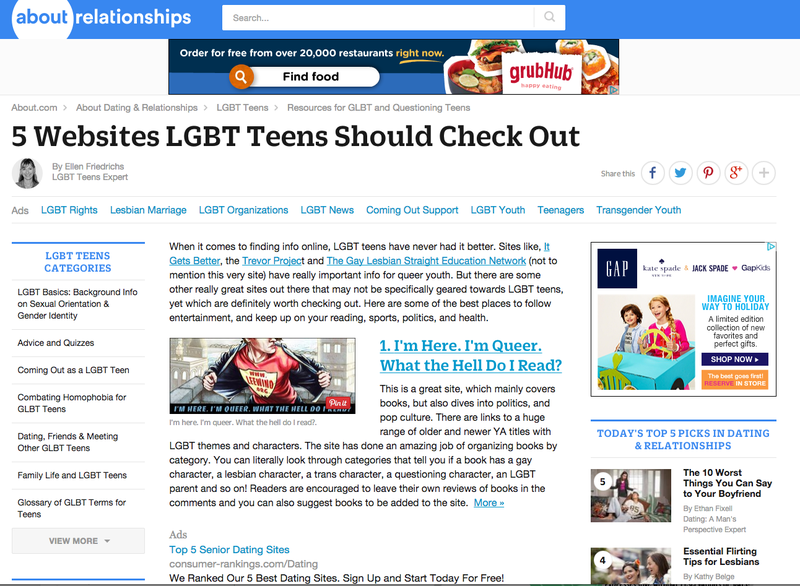 I'm really excited about this about.com article, "5 Websites LGBT Teens Should Check Out" by Ellen Friedrichs. Recognize the logo? My blog makes the list! And when you do check out the article, you'll find I'm Here. I'm Queer. What the Hell Do I Read? is NUMBER ONE! "1. I'm Here. I'm Queer. What the Hell Do I Read? This is a great site, which mainly covers books, but also dives into politics, and pop culture. There are links to a huge range of older and newer YA titles with LGBT themes and characters. The site has done an amazing job of organizing books by category. You can literally look through categories that tell you if a book has a gay character, a lesbian character, a trans character, a questioning character, an LGBT parent and so on! Readers are encouraged to leave their own reviews of books in the comments and you can also suggest books to be added to the site."